Prostate cancer is the most common cancer among males in the United States. Approximately, 180,000 men are diagnosed each year, and approximately 95 percent of these men have localized disease that is potentially curable. Previously, studies have consistently demonstrated that conventionally fractionated high dose external beam radiation therapy (CRT), consisting of daily treatment for two months, decreases prostate cancer recurrence, and improves metastasis-free survival. Previous studies also demonstrate that moderate hypo-fractionated radiation therapy (HRT), consisting of daily treatment for one month using a larger dose per treatment, provides a similar low risk of recurrence, and may even be lower with HRT than CRT. To accurately test the hypothesis of a lower risk of recurrence with HRT, a new study led by investigators at Brigham and Women's Hospital published in European Urology Focus, performed a systematic review and meta-analysis, pooling available data, to assess whether an improved risk of recurrence could be demonstrated using HRT compared with CRT, in addition to assessing the relative impact of these two treatments on bladder and rectal function. Researchers found that the one-month duration HRT, was associated with a significant improvement in recurrence compared to the two-month duration CRT and therefore would be reasonable to consider in men with intermediate risk prostate cancer and who do not have risk factors that could predispose the patient to bladder side effects several years after the treatment is complete. "Our results provide evidence for clinicians to consider HRT as compared with CRT as a preferred radiation treatment in men with intermediate-risk prostate cancer and at low risk of other complications," stated Trevor Royce, MD, MPH, radiation oncologist at Brigham and Women's Hospital and first author of the study. "Treatment with a shorter course of radiation and higher doses over fewer days may be the preferred approach in appropriately selected patients with localized prostate cancer, reducing treatment time and cost to the patient, and increasing patient convenience and access to treatment." Researchers analyzed data from over 5,000 men from three randomized studies comparing HRT with CRT in men with prostate cancer. 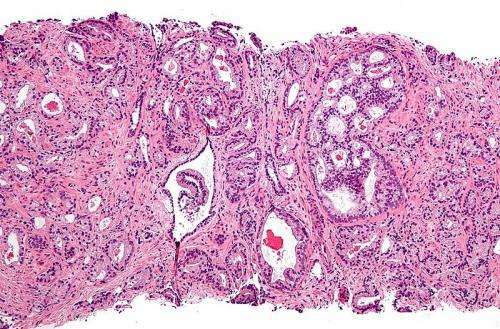 Of the 5,484 men, 3,553 men, or 64.8 percent had intermediate-risk prostate cancer. HRT as compared with CRT was associated with a significant 13 percent reduction in the risk of recurrence. No significant difference in overall survival was found between HRT and CRT but researchers noted that the possibility exists that men in excellent health could also achieve an overall survival benefit with HRT as compared with CRT. "Late bladder and urethra toxicities were noted to be higher in the HRT as compared to CRT group which necessitates carefully choosing men who are not at risk for sustaining a late bladder or urethral side effect," said Anthony D'Amico, MD, PhD, chief, Genitourinary Radiation Oncology at Brigham and Women's Hospital, and senior author of the study. "Men to exclude would be those who get up more than three times at night to urinate, or have urgency to urinate, or incontinence, or men who are on anti-coagulants that could increase the risk of bleeding," D'Amico said. Researchers say further study is needed using individual patient-level data among men with high risk prostate cancer to assess the benefit of HRT and whether treatment toxicity, particularly those to the bladder and urinary system are also low with HRT.